This exuberant hand-appliqued quilt was inspired by the nineteenth-century German textile designer Friedrich Fischbach. Karen cut each piece for the center motif and arranged it on a design board before beginning to sew so she could make changes easily. After the center was stitched, she selected the fabric for the edge and designed the border using elements from the center. The quilt also includes reverse applique, piping, and more than 400 circles. Karen says, "I love making circles, but quilting around each one is another story!" 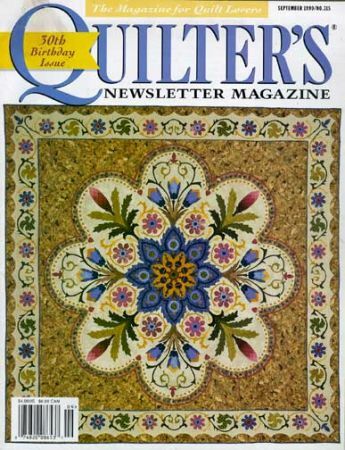 Earthly Delights appeared on the September 1999 cover of Quilter's Newsletter Magazine.